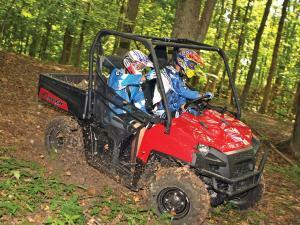 No machine has played a bigger role or has had more impact for a wider variety of owners than the Polaris Ranger. Before the Ranger, John Deere’s Gator and Kawasaki’s Mule were about the only choice for any serious, work capable utility vehicle. Both the Gator and the Mule were solid performers on the farm or the job site, but weekend recreation was not their domain or even much of a consideration. The new Ranger, however, offered the ability to haul everything from bricks to hay bales all week and camping, hunting, or fishing gear all weekend. Plus it did it with more power, more features, better handling, and vastly improved ride quality. The game had changed, and the new master was called Ranger. 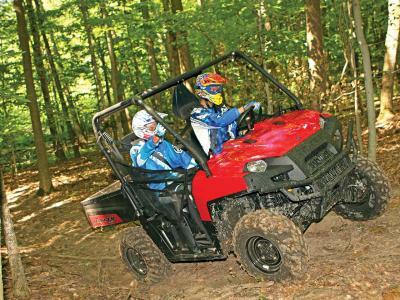 With the introduction of the Ranger, Polaris had identified a vast, yet largely untapped customer base. 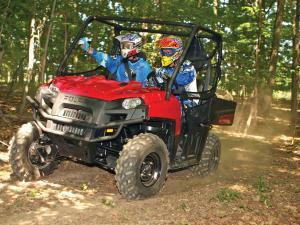 It was the perfect complement to the Polaris Sportsman ATV lineup, with the ability for both serious work and play. 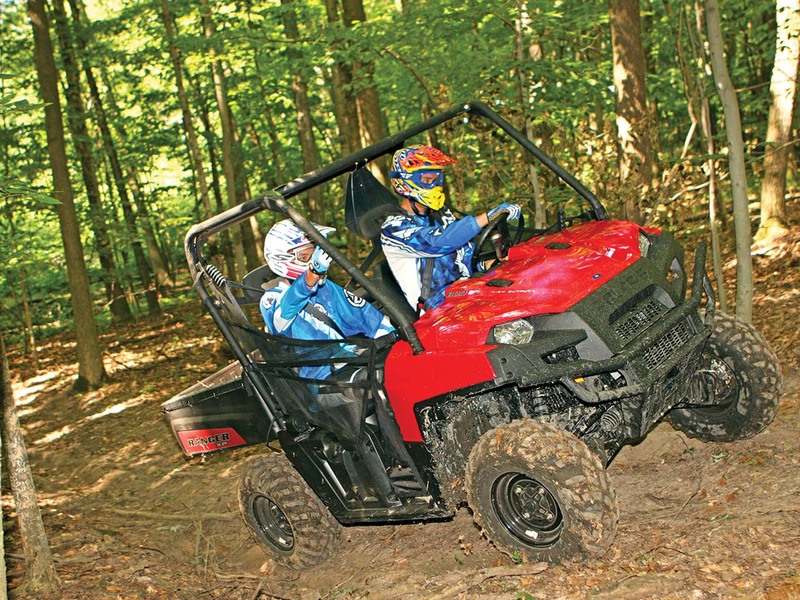 Since its introduction back in 1998, the Ranger has received more power, suspension updates, and nearly continuous improvements in every aspect of its design. It has also become one of our favorites and our Ranger sees action nearly every day, tirelessly taking on every task imaginable. It’s our daily go-to performer. Polaris wanted to create an exterior that could handle the nastiest work and extreme riding conditions and the result was the most armored Ranger front end ever designed. The front end better protects vital components such as the radiator, cooling system and front differential, all safely tucked under the bodywork and protected by the chassis. Front headlights are inset for added protection, and the heavy duty bumper offers an integrated bash plate and a central tow hook / tie down point. 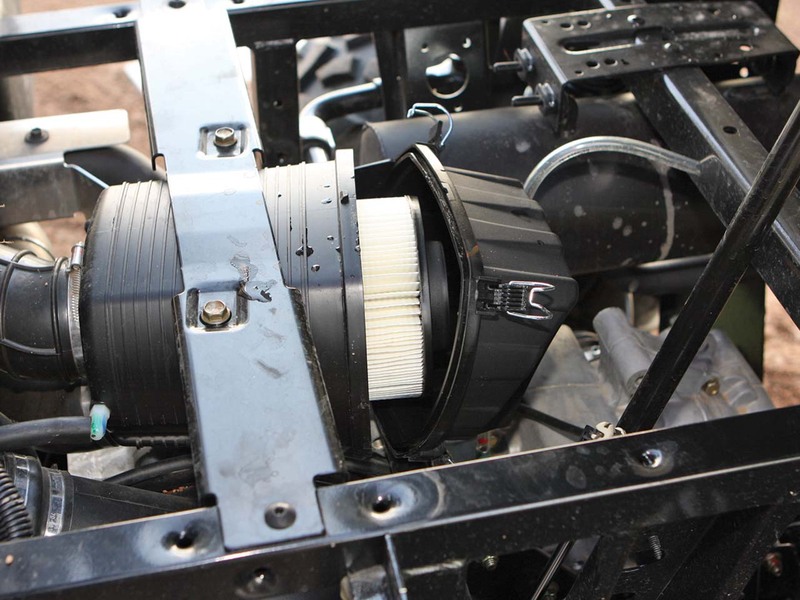 For finding your way to the hunting spot before daybreak, Polaris thoughtfully added pre-drilled auxiliary light mounting holes on the front bumper for optional Halogen/LED distance headlights. Slightly squared-off fender wells give a hint of truck styling, and the color-matched front hood and cargo bed help complete the visual package. The Ranger XP 800 looks tough and ready for action! Rangers have always offered excellent seating for three, and the latest generation XP 800 cab interior has been reworked for extra comfort and leg space. The large bench seat is sculpted to hold you in place and the cover material appears to have been improved with a thicker, anti-tear vinyl designed to help with “rump-slide” on rough trails. Seat belts keep you safe, while side nets protect from any stray branches, mud, or any other unwanted objects poking into the crew area. 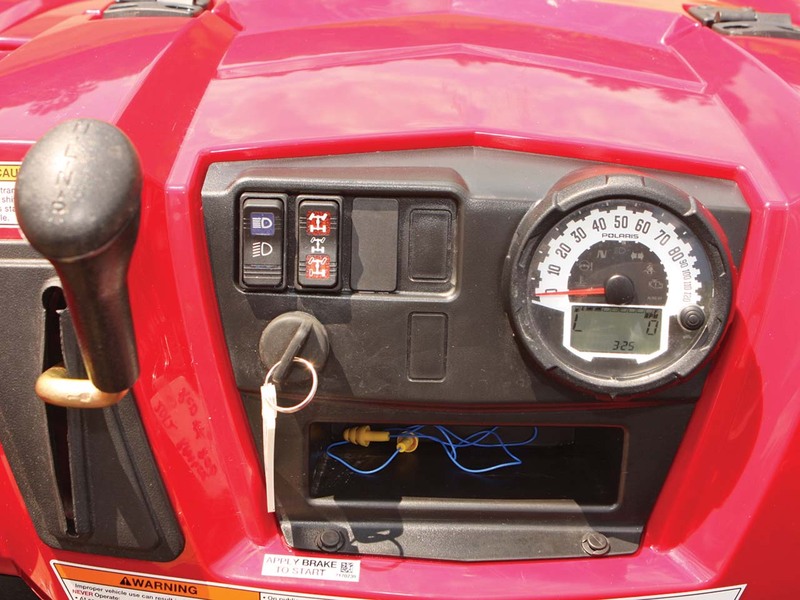 We like how the gas & brake pedals have also been oriented for operator comfort. There is room for improvement though. The cab floor can be slippery and a more aggressive textured surface should be considered. On the dash, the steering wheel is designed for excellent grip and feel, even with heavy gloves, and Electronic Power Steering (EPS) means you can practically turn the Ranger with one finger. The EPS system also has a dampening effect and prevents steering wheel kickback. 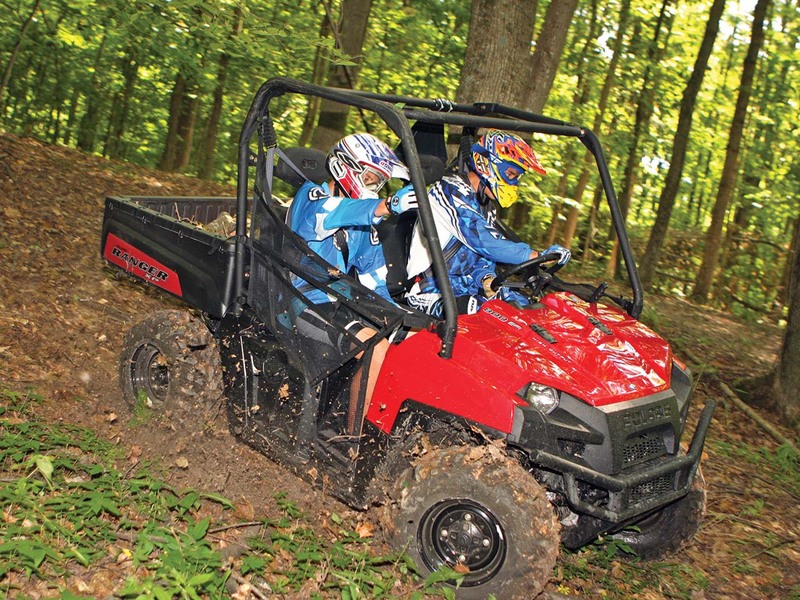 Although the Ranger XP is available without power steering as well, once you have it, you’ll never go back. It’s well worth the extra money up front. The tilting wheel also has 10-inches range of motion for maximum comfort, and it all adds up to easy maneuverability even in tight spaces. 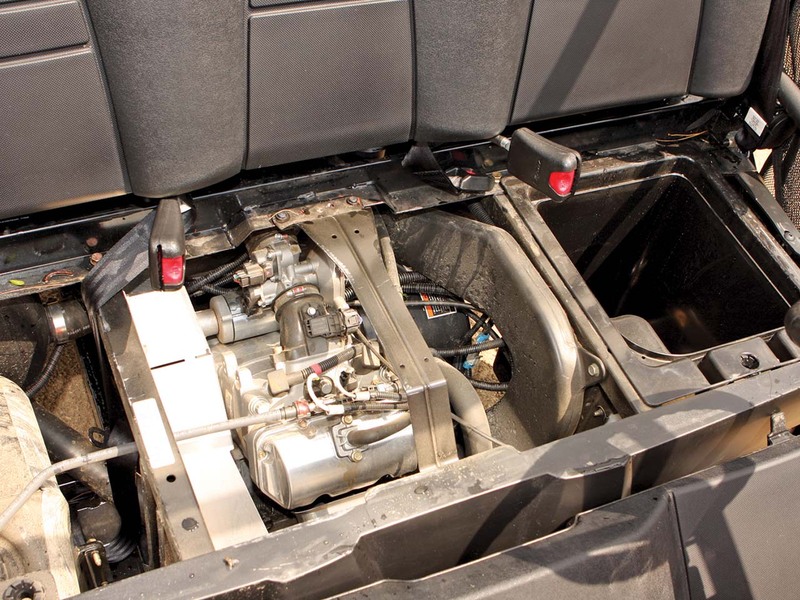 Polaris has always provided plenty of storage, and there is both an open storage area on the dash as well as a very large, sealed glove box, while beneath the driver’s seat is another huge storage bin. The switchgear for lights and 2wd, 4wd, and Turf Mode (one wheel drive) traction settings are pretty straightforward but are noteworthy for the upscale appearance the backlighting gives them. You’ll be glad to have them every time you ride at night. Cup holders have been positioned at the dash ends. Situated on the far left of the dash for easy operation is the parking brake lever. If you try moving the Ranger with the brake on, the engine will begin stuttering as a reminder. It’s hard to overestimate how handy it is to have a brake lever with a warning light and engine stutter, and there’s even a dash-light when the brake is set! Together the stuttering and warning light make it almost impossible to wear out the parking brake. There's also a practical advantage to the parking brake being on the top far left. If you forget to set the brake and the machine begins rolling, you don’t have to jump back into a moving vehicle. Just (carefully) grab and pull from an arm’s length. Other dash-mounted features include an easy to read instrument panel that houses a multi-function speedometer, hour meter, trip meter, tachometer, fuel gauge, range selection indicator and parking brake warning light. At your right hand is the elegant and ergonomically sound range selection lever which requires less effort and range of motion to toggle between gears. It works great for back & forth tasks such as snowplowing. 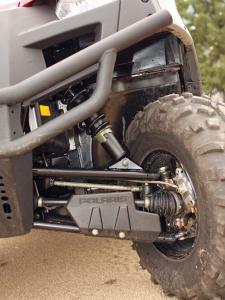 All Rangers have suspension systems with a comfort factor you seldom find anywhere else. Dual A-arms at the front and Independent Rear Suspension allows each wheel to articulate independently for maximum traction in uneven terrain. At the front the Ranger offers 9.6 inches of wheel travel, with 9 inches at the rear. A very respectable 12 inches of ground clearance keeps you from getting hung up, and our 2012 Ranger seems to sit a little taller than in years past. As expected for any Ranger though, the ride is excellent. Should you find yourself pin-balling down some boulder-strewn ravine, however, you’ll be relieved to know that the XP 800 has full skid plates and CV-joint protection. It also has exceptional braking. Polaris wisely installed hydraulic disc brakes at each wheel for maximum stopping power. Over the years, we’ve often noticed the way Rangers squat when loaded to their maximum capacity. In response, engineers developed “motion-ratio adjustability” and it’s the only 4-corner adjustable suspension system in the sport. 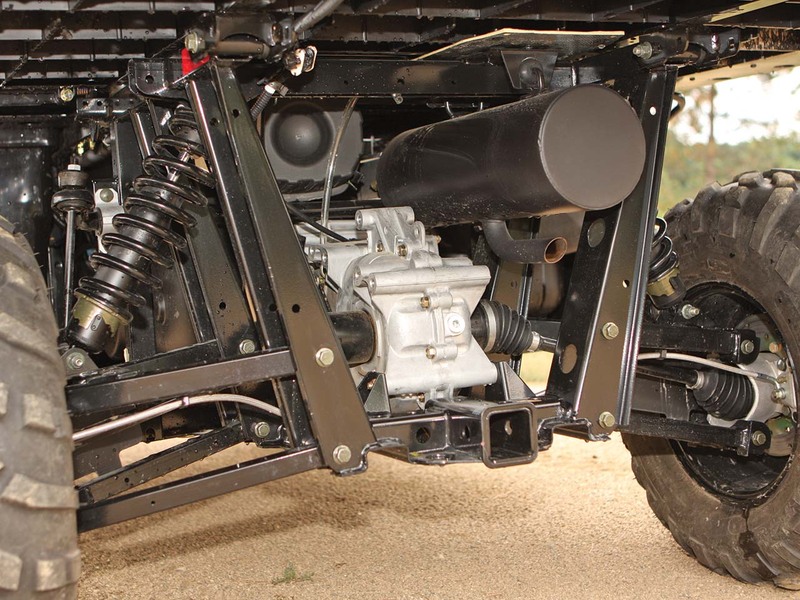 The suspension can be dramatically stiffened by changing the position of the top shock bolt mount, giving it a straighter up & down configuration, which allows the shock to “work” more. Also, thanks to preload adjustability at each wheel, the initial spring compression can be increased for a 30 percent stiffer ride when needed for carrying a heavy load. When combined, the dual adjustments help maintain ground clearance and consistent suspension travel, even when carrying heavier loads and using accessories. 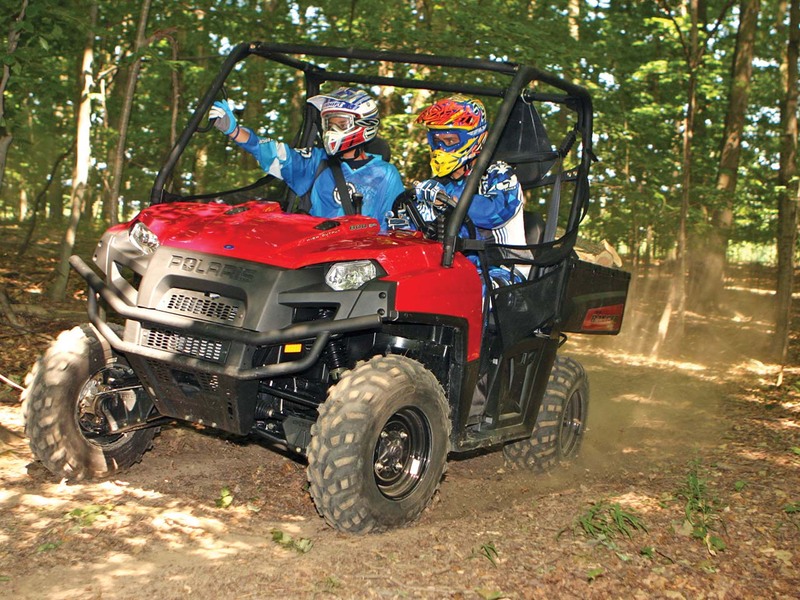 Polaris bumped up the power and the top speed on the Ranger XP 800 and the 760cc, liquid cooled, Electronic Fuel Injection equipped twin cylinder engine now pushes the XP to 55mph with 50hp on tap. The EFI system ensures the engine always starts instantly, delivers precise response to driver input, and acceleration is brisk. The XP engine is mated to a CVT transmission featuring High, Low, Neutral, and Reverse. 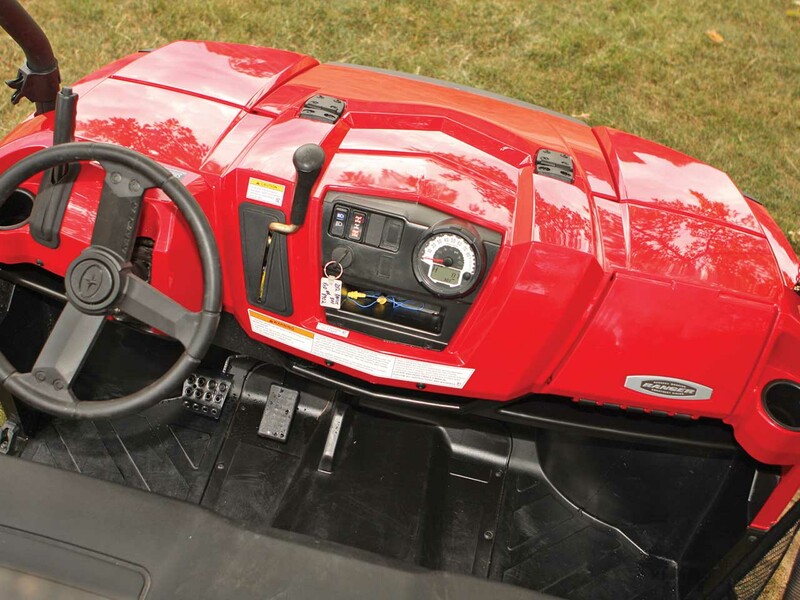 The all-wheel-drive, “On-Demand” Polaris system electronically monitors all wheels and seamlessly transfers power back & forth if any are losing traction. The system can be operated in 4wd, 2wd, or in Turf mode which is perfect for sensitive areas. Turf Mode was perfect when we were working on a local ball diamond infield. Selecting the rocker switch on the dash is the only “demand” it makes on you. Maintenance is a huge concern for us, and in that area the Ranger XP 800 could see improvements. We do like the oversized, cartridge style air filter which is easy to get to under the bed and does a great job, but reaching the oil filter is another matter. The filter is tucked almost under the engine and it’s not easy to get your hand or much grip on it, at least from the top side. Draining the oil requires crawling under the Ranger and removing a drain plug, which isn’t bad. Perhaps filter access would be easier from the bottom since you’re there anyway. A small, bottom, filter access panel might make life easier for Ranger owners. That leads us to problem two. The only way to refill the oil is to pour it down the narrow dip stick tube. It can be done, but it takes a while. 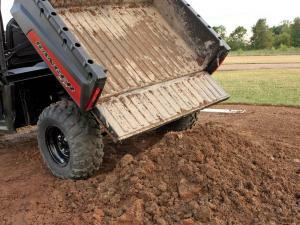 The Ranger XP 800 is equipped with a tough, versatile cargo box capable of hauling a normal shipping pallet. At the rear is a reliable, single-lever tailgate latch, and a self-cleaning gate hinge. You can release the latch and dump the box from either side, and the assist lift is strong enough that one person can dump it even when fully loaded. In fact, the assist-lift is so strong that it takes two hands to lower it back down! Inside the box are several tie down points, and around the perimeter are numerous holes for Polaris Lock & Ride accessory mounts. 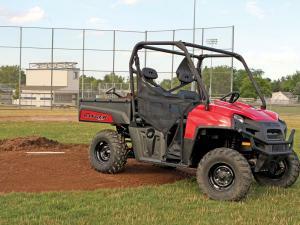 Bridging the gap between work and weekend recreation, the original Polaris Ranger redefined what a Side x Side was capable of and many models today can trace their roots back to that watershed moment and machine. Since then the Ranger has received continuous updates, and today the Ranger XP 800 offers a seamless balance between handling, comfort, and capability in a great looking and extremely reliable package. They’re the definition of the do-it-all Side x Side, and the leaders of their class.